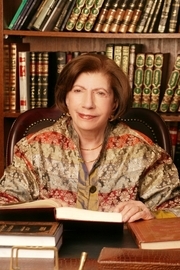 She completed her secondary education at Schmidt's Girls College in Jerusalem, and then graduated with honors in Arabic and English Literatures from the American University of Beirut. Soon after her graduation she married a Jordanian diplomat and lived, as a diplomat’s wife, in several countries. She only began her career as a writer and professor after raising her 3 children. Soon after obtaining her Ph.D. in 1970 she started her career as a University Professor teaching first at the University of Khartoum (1970-1973), then at the Universities of Algiers and Constantine (1973-1975)." Salma Khadra Jayyusi is currently considered a "single author." If one or more works are by a distinct, homonymous authors, go ahead and split the author. Salma Khadra Jayyusi is composed of 11 names. You can examine and separate out names.